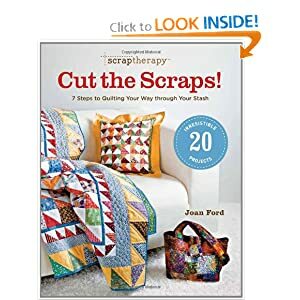 bananaquilts: Quilty book review it's scraptastic! Quilty book review it's scraptastic! So yesterday I stumbled upon the quilty world of Bonnie K Hunter. Someone on craftster was holding forth on her amazing method of scrap sorting and storage, so I thought I'd check it out. Here's the link to her blog http://quiltville.blogspot.com/ and her website http://quiltville.com/. From what I read, Bonnie has a system to cut up her scraps into certain useful sizes and she separates them and keeps them so that they are ready to go. She also provides heaps of patterns to use up all of the scraps. Bonnie sounds like a very nice lady, and I have already become a fan of her page on Facebook so I can pick up some more interesting tips. This got me thinking about a book I'd recently borrowed from the library, so I sat down and read that too. It is called "Cut the Scraps!" by Joan Ford, inventor of ScrapTherapy. I rather like the pun in the title. In fact, most books can benefit from a little word play in the title. This system of scrap storing is much simpler than Bonnie's. Joan Ford specifies the following sizes to keep: 2", 3.5" and 5". That's it! Any scraps left over from a project get cut up into one or the other of those sizes and then put away for a scrap quilt. Anything smaller just gets thrown out. There are instructions for how to cut the squares and then sew them together and it includes 20 great looking scrap quilts. There is only one problem with this book that I can see...I don't have enough scraps!! So far all my quilting projects have been done on such a tight budget that there is none left over. I do really like the quilts in this book though so I hope one day to accumulate a scrappy stash. My favourite pattern is "Runaway Thread", which features brightly coloured reels of thread against a white background. It is fabulous. I highly recommend this book. But if you are like me and can't buy all the books you like, just make sure to be friends with Bonnie K Hunter, she's a gem. I so admire quilters. I really dislike anything having to do with sewing myself, but I love to see what other creative people come up with. I love quilts -- They seem like so so so much work. I wouldn't have the patience for something that takes that long to complete. I can feel your excitement about building up a fabric stash. I need to do something that will use some of mine up! What a great idea! I always hate throwing out my scraps. This is awesome. I keep lots of scraps and use them for fabric flowers as embellishments. Maybe someday I can put together a quilt. Each piece has a story. How resourceful! I will make sure I keep all my scraps for.....one day!